Spring cleaning is just around the corner and we want to help your home feel fresh and safe, for your family and for the environment! Check out these cheap and easy DIY cleaning solutions that will leave your house smelling lemony fresh. Dip half a lemon in a small bowl of baking soda. 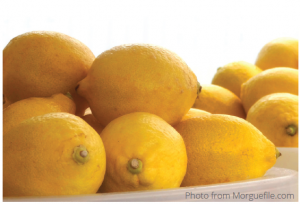 You can use the lemon itself as a scrubber! You can also make a powerful bathroom cleaning paste by adding lemon juice to a few tablespoons of baking soda. Mix slowly until it becomes a paste. Add a small amount of dish fluid for a more powerful cleanse. Apply with a sponge and watch your bathroom sparkle. Pour some vinegar into a coup with a tablespoon or two of lemon juice. Microwave the cup for two full minutes. Don’t open the door immediately – let it sit for 2 -3 more minutes after the microwave goes off. Then simply wipe away grime with a sponge. It’s that easy! Out of sight, out of mind. Unfortunately, a dirty garbage disposal can be a stinky situation. It’s an easy fix though. Pour 1 cup of vinegar into an ice cube tray and then top off with water. Pop the tray in the freezer until it’s solid. Then just drop the cubes into the disposal and let it run. The ice chunks should remove any food that was stuck to the blades!